Sometimes when you have many Price Items which make up an overall total price, it may not be in your best interest to expose all these prices to your customer. If this is the case, you could hide the item pricing and quantity values, keeping the breakdowns hidden from your customer’s view. Show Item Quantity only ← NEW! 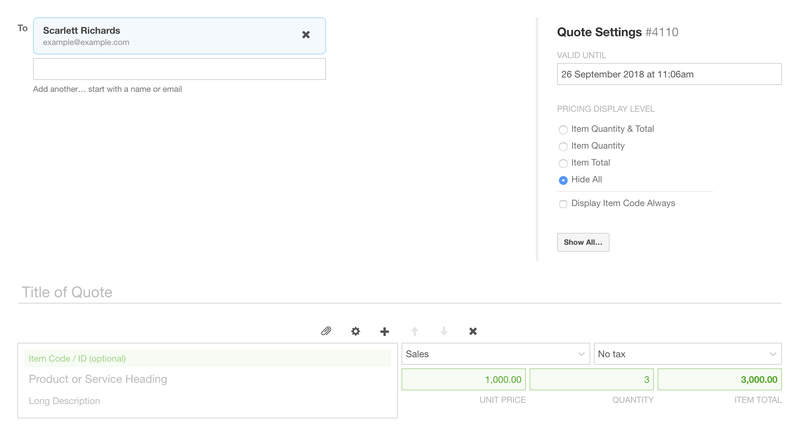 Pricing Display Level can be set account-wide (for new Quotes) in Settings > Quote Defaults. It can also be set when editing a Quote (or a Template) under Quote Settings. You may need to hit ‘Show All…’ if it’s not showing here. Hidden Price Item fields are marked in green. If an Item has a Quantity hidden, the Quantity will always display as 1. For example: Quantity 3, Unit Price $10. Would become: Quantity 1, Unit Price $30. Item Long Descriptions will populate into individual invoice line items with empty quantity/price/account/tax fields – for the purpose of showing information from the Quote. A single invoice line item will contain the total cost of ALL items – for the purpose of showing consolidated pricing from the Quote. If Price Items have differing Sales Categories or Tax Rates, then additional items will be created on the invoice. Even though Item Codes may be hidden in Quotient, they may still display on your Xero or QuickBooks invoices. There may be times when you have all pricing hidden, but the invoice in QuickBooks will display some (or all) prices and quantities. This happens if a Price Item Heading (on the Quote) matches a Product/Service in QuickBooks.